The most useful strategy cards ever designed. 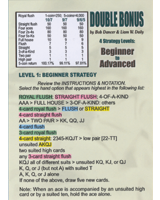 Four strategy levels take you from beginner to advanced, all on one 6 panel tri-fold pocket-sized card. 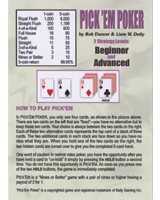 These new video poker strategy cards were developed by everybody’s favorite video poker authority–Bob Dancer–along with strategist extraordinaire Liam W. Daily, and may be the best strategy cards ever devised for any game. 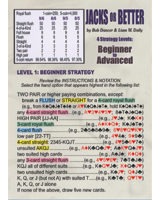 The “Beginner” strategies alone will improve almost anyone’s play, while those who graduate to the “Advanced” strategies will be playing virtually as accurately as a computer. 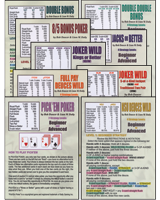 Carry the cards with you into the casinos and refer to them while you play. 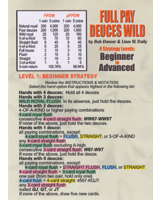 Never misplay a hand again! !